Date: 13/07/10. Watched in the middle of another extremely boring day at home. I really really don't want the holidays to be over though. Honestly, with a title like The Men who Stare at Goats, I couldn't help but be a little intrigued by this project. 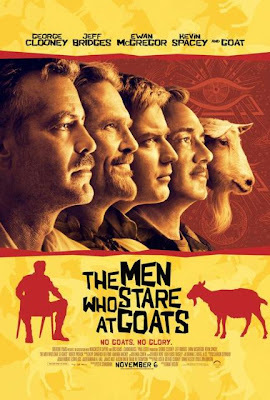 But, when I thought about it, that title was totally random, and who would make a movie about men staring at goats?? Grant Heslov, obviously. A reporter, Bob Wilton (Ewan McGregor) meets Lyn Cassidy (George Clooney), who introduces him to the world of war in Iraq. When he gets there, Bob finds out that there is a special group who specialize in using paranormal powers in their missions, and who live the hippie lifestyle. During their journey, Bob finds out a lot more about Lyn's history and what happens in the army in Iraq, but ultimately gets the story he has been searching for. Aside from the fact that the title is utterly weird, it is actually kind of true. Don't worry, they don't sit through the whole movie staring at goats, as it is reduced to one scene, but goats play a big factor in this movie. Um, so apart from the fact that it is about the war in Iraq, with hippies, it's satirical view on the matter kinda needs a college degree to get. For a dumb person, such as myself, we will find some bits boring, and other bits funny and interesting. However, those 'in the know' with what happpens in Iraq will totally get it. Guess I should really watch more of the news instead of the 50 millionth repeats of Friends. The cast was in fine form, especially Jeff Bridges, who was particularly hilarious as hippie Bill Django. This a fairly entertaining fare, but it just doesn't live up to the quirkyness the title promised. The Men who Stare at Goats is okay, but don't expect too much from it.